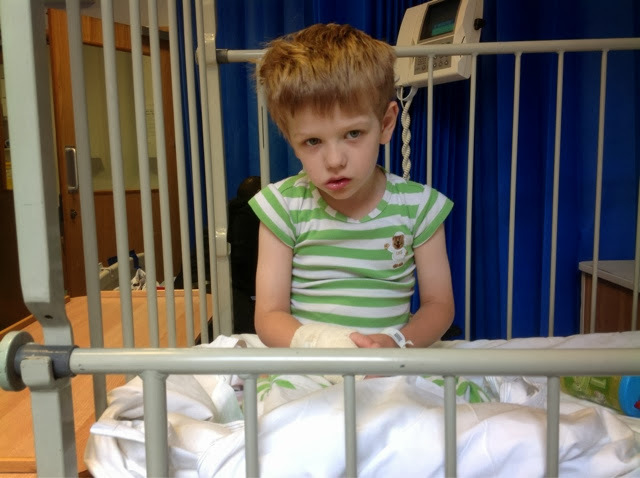 This week B takes us all by surprise by having his first seizure or fit. It's Sunday lunchtime and B's daddy is making roast. B disappears upstairs briefly. We've started letting him do this because the team at Brainwave have suggested we give B more independence. The bottom stair gate has been removed for some time (since it fell off) and we are keeping the top gate open to allow B some freedom. He goes up to his bedroom to play which is not unusual but typically I'm always on edge, always keeping an ear open to him. This is some of the daily challenge of raising a child like B. You are always alert, never relaxing, never truly resting. Anyway, I can normally hear him playing and hear his little noises so I know he is okay. But after a little bit (I'm on the sofa knitting) I realise he's been quiet for a few minutes. So I go up to check on him and his got himself into bed and is throwing himself around the bed squirming and jerking and his eyes are rolling into the back of his head and he's moaning. It's so frightening but I don't panic. My mother's intuition tells me it's wrong and he needs help. So I call down to B's dad yelling there's something wrong with B. I get straight on the phone and dial 999. I've had to do this before so it's not as scary as the first time. I try to stay calm on the phone whilst B's daddy is trying to help B. I ask for an ambulance and explain what's wrong. It's hard to explain as we've never seen a fit before. All I know is that B is going unconscious and I'm worried he can't breath. He's now floppy and unresponsive. The ambulance doesn't come after 10 minutes and we call back. Still no sign of the ambulance and I'm pacing the path outside the house listening for the siren. The kids are freaking out too because they have never seen their brother like this and they are scared. L says she doesn't want B to die and that breaks my heart a little bit. I'm scared but trying to keep it together. The ambulance doesn't come after 30 minutes. We are still pacing with B's daddy trying to keep B awake and his breathing is funny and his tummy is making weird noises. We phone the ambulance again and they promise it's on its way. We could have got ourselves to hospital quicker than this. After about 45 minutes the ambulance finally arrives. The staff are brilliant and reassuring. The ambulance response lady on the phone says let B go to sleep so when the ambulance staff treat him they give him some oxygen and he starts to wake up a bit. Looks around but goes back to sleep again. He is like this in the ambulance to the hospital. Alert for a bit and then he conks out again. B's daddy takes A in the car and L comes with me in the ambulance. We aren't bluelighted to hospital (which is always reassuring) and when we arrive it's back to A&E and normal A&E service resumes. We're back in the system. Sitting and waiting in the dullest place in the world. I hate A&E. The staff are overworked, tired but they do their best. I've tried to pack some stuff in a rush but I don't have everything and the kids get bored. B is just sleeping on my lap until he gets seen. After what seems like hours and explaining the same thing over and over, B finally gets admitted to the children's ward for observations. He has had his bloods taken (he was too sleepy to really complain) and his urine sampled. I haven't eaten anything since breakfast. Remember the roast that was cooking when all this happened - well that was ruined. Hospital don't provide food for guests of patients and the only food available is chocolate from the vending machine. By this point B's daddy has taken the kids home and I'm on my own with B. I can't leave him on his own and I feel a bit trapped. About 10pm I get given a beef sandwich, probably left over from the day's catering. I'm vegetarian but I'm desperate so I eat it. Fortunately B's daddy comes back later with my stuff and some goodies for me. Must remember in future to keep a packed emergency bag of supplies in the car. One of the things that was most distressing about being in hospital is explaining to everyone that B is disabled. He can't speak and he can't answer their questions. I wanted to put a great big sign over his head saying "I CAN'T SPEAK". I had to explain it over and over. I persuaded them to let B sleep in one of the baby cots because it's not safe to let B sleep in a normal bed. He could fall out of it or even climb off it and go wondering! He was too big for the cot but he was fine curled up to sleep. I don't what we will do when he really is too big for the hospital cot. It surprises me that they don't have a better facilitiy in place for disabled adults with learning and behavioural difficulties. I'm sure we are not the only family! I sleep on a camp bed on the floor. I get some sleep on and off and B is sleeps well for a change. Staff say it's totally normal to sleep so much after a fit. B doesn't have any more fits but I'm woken up all night by observations and two more children being brought in in the middle of the night.